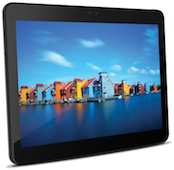 Homegrown hardware manufacturer iBall has added yet another member to its Slide 3G family of tablets. The new device, called Slide 3G Q1035, runs on the Android Jelly Bean operating system. While the company has priced it at Rs 17,999, it is available on a number of e-commerce stores for Rs 17,499. Prior to this, the company had launched Slide 7334i 3G (June 2013) and Slide 3G 8072 (Oct 2013) for Rs 10,499 and Rs 11,999 respectively. While its predecessors sported a 7 and an 8 inch display, the new tablet comes with a 10 inch screen. Here is a look at the specifications of the device. The tablet has a 10.1-inch IPS HD capacitive touchscreen display (1280x800 pixels resolution) and is powered by a 1.2 GHz Quad-core Cortex A7 processor. It runs on the Android 4.2 Jelly Bean operating system and has 1 GB of RAM. The internal memory of the device is 8GB (approximately 2GB used by the OS and applications files), which can be further expanded up to 32 GB with a microSD card. Slide 3G Q1035 has an 8 mega pixel auto-focus rear camera with Flash that can also record videos and a front-facing camera for video calling. On the connectivity front, the device has Wi-Fi, Bluetooth and 3G (as the name already suggests), and also comes with a microUSB port, a microHDMI port & a microSD card slot. The exact dimensions of the tablet are not available as of now, but the tablet is powered by a 6,000 mAh battery. It will be available in black and grey colours, and comes with wireless FM radio. In addition, the device is capable of high definition (HD) video playback, has GPS (with A-GPS support) and comes with dual-SIM (with dual standby) support. In the same range, you can get your hands on tablets like Asus TF101 (Rs 19,990 for the 16GB Wi-Fi version), Huawei MediaPad 10 Link (Rs 20,490), Milagrow MGPT05 (Rs 17,999 for the 16GB version), and iberry Auxus CoreX4 3G (Rs 18,000), among others. Besides covering the mid-price segment, iBall also offers a number of low-priced smartphones and tablets in the country. Earlier this year, the company launched its costliest smartphone offering, Andi 4.7G Cobalt, for Rs 19,995. Prior to that, it came up with a Quad-core tablet offering, Slide Q9703, which sports a 9.7 inch display (2048 x 1536 pixel resolution) and is priced at Rs 15,999.